Best Western Rewards has a new promotion for a free night certificate after three stays between June 17 and August 18, 2013. You need to register for this promotion by July 28 and you can do it here. The free night certificate that is valid until January 31, 2014, will be emailed to the member’s email address on file 2 to 3 weeks after qualifying for it and it is valid for Best Western branded hotels in the United States, Canada, or the Caribbean. There is a list of participating countries for this promotion. If your Best Western Rewards account address is in one of the participating countries, then your stay can be at any Best Western property worldwide. If your account address is NOT in one of the participating countries, the stays then need to be in participating country/countries. Confusing, isn’t it? Best Western Rewards MasterCard members will receive 1000 bonus points for registering this offer and paying the three stays using the Best Western branded credit card. Best Western seems to run these free night certificate promotions fairly frequently, but they are always capped at just one certificate that is usable in the United States, Canada, or the Caribbean. It is a good promo for those that have stays coming up at Best Western branded hotels. Best Western Rewards® members (“Member(s)”) residing in a participating country† who register for the Promotion by July 28, 2013, and complete three separate qualified stays* between June 17, 2013, and August 18, 2013 (“Promotion Period”), at Best Western branded hotels worldwide, will earn a free night voucher redeemable at Best Western branded hotels in the United States, Canada, or the Caribbean Islands. Members residing outside of one of the participating countries†, who register for the Promotion by July 28, 2013, and complete three separate qualified stays at Best Western branded hotels in a participating country† during the Promotion Period, will earn a free night voucher redeemable at Best Western branded hotels in the United States, Canada, or the Caribbean Islands. Promotion Registration and Best Western Rewards enrollment/membership required prior to the first qualified stay. Stays completed prior to Promotion registration will not count towards fulfilling the Promotion requirements. Limit one free night voucher per Member during the Promotion Period. Free night voucher expires January 31, 2014. No free night voucher extensions, substitutions, or replacements available. *A “qualified stay” for the purpose of this Promotion is defined as one or more consecutive nights at the same Best Western branded hotel at a rate eligible for earning points or airline/partner rewards through Best Western Rewards. Only one check-in/check-out permitted per qualified stay. Bonus Reward: A Member, who satisfies the qualification requirements discussed above and uses their Best Western Rewards® MasterCard® to pay for each of the three qualified stays, will receive 1,000 Best Western Rewards bonus points. Maximum of one bonus reward per Member. Bonus points will be posted to the Member’s account approximately 4-6 weeks after the third qualified stay. 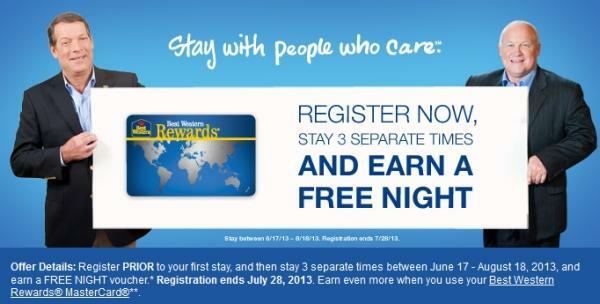 Bonus reward is in addition to the standard Best Western Rewards point earning structure. Promotion is not valid with any other offer, promotion, or discount. Promotion is subject to cancellation or change without notice. Free night voucher redemption subject to hotel availability. Free night voucher redemption reservation must be completed by calling 1-800-567-4009. If a valid email address has been provided in the Member’s account profile, the free night voucher may be sent electronically to the valid email address 2-3 weeks from completion of the third qualified stay. Otherwise, a paper voucher will be mailed to the address in the Member’s account profile 4-6 weeks from completion of the third qualified stay. All Best Western Rewards program rules apply. Visit www.bestwesternrewards.com for complete program terms and conditions. MasterCard® is a registered trademark of MasterCard International, Incorporated, used pursuant to license. †Participating countries are: Afghanistan, Albania, American Samoa, Andorra, Angola, Anguilla – St. Kitts, Antarctica, Antigua and Barbuda, Aruba, Bahamas, Barbados, Benin, Bermuda, Botswana, Bouvet Island, Burkina Faso, Burundi, Cameroon, Canada, Cape Verde, Cayman Islands, Chad, Christmas Island, Cocos Islands, Comoros Island, Congo, Cook Islands, Cote d’Ivoire, Cuba, Djibouti, Dominica, Dominican Republic, Eritrea, Ethiopia, Falkland Islands/Malvinas, Faroe Islands, Fiji Islands, former USSR, Gabon, Gambia, Georgia, Ghana, Gibraltar, Greenland, Grenada, Guadeloupe, Guam, Guinea, Guinea Bissau, Guyana, Haiti, Heard and McDonald Islands, Iceland, Jamaica, Kenya, Kiribati, Lesotho, Liberia, Libya, Madagascar, Malawi, Mali, Marshall Island, Mauritania, Mayotte, Micronesia, Montserrat, Mozambique, Namibia, Nauru, Netherlands Antilles, Niger, Nigeria, Niue, Norfolk Island, Northern Mariana Islands, Palestine, Panama, Pitcairn Island, Puerto Rico, Republic of Palau, Rwanda, S. Georgia and S. Sandwich Islands, Saint Helena, Saint Kitts and Nevis Anguilla, Saint Lucia, Sao Tome Principe, Senegal, Seychelles Islands, Sierra Leone, Solomon Islands, Somalia, South Africa, St. Pierre Miquelon, St. Vincent Grenadines, Sudan, Svalbard and Jan Mayen Islands, Swaziland, Tanzania, Togo, Tokelau, Tonga, Trinidad and Tobago, Turks and Caicos Islands, Tuvalu, USA Minor Outlying Islands, Uganda, United States, Vanuatu, Virgin Islands, Wallis Futuna Islands, West Indies, Western Sahara, Western Samoa, Zambia, Zimbabwe, Bahrain, Bangladesh, Bhutan, Brunei, Cambodia, China, East Timor, Hong Kong, India, Indian Ocean Islands, Indonesia, Iraq, Iran, Japan, Jordan, Kazakhstan, Korea, Kuwait, Laos, Macau, Malaysia, Maldives, Mauritius, Mongolia, Myanmar, Nepal, Oman, Pakistan, Philippines, Qatar, Saudi Arabia, Singapore, Sri Lanka, Taiwan, Thailand, United Arab Emirates, Uzbekistan, Vietnam, Yemen, Argentina, Belize, Bolivia, Brazil, Chile, Colombia, Costa Rica, Ecuador, El Salvador, Guatemala, Honduras, Mexico, Nicaragua, Paraguay, Peru, Suriname, Uruguay, and Venezuela. the United States, Canada, or the Caribbean Islands. Limit one free night voucher per Member during the Promotion Period. of the third qualified stay. International, Inc. ©2013 Best Western International, Inc. All rights reserved. Guatemala, Honduras, Mexico, Nicaragua, Paraguay, Peru, Suriname, Uruguay, and Venezuela.